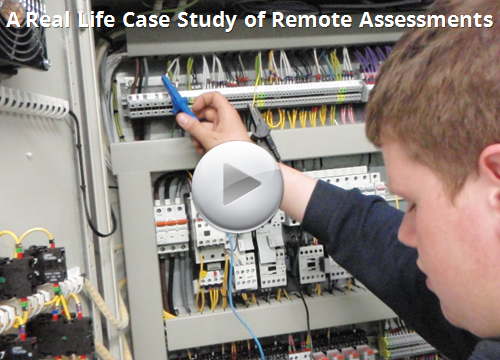 To overcome all the difficulties around on-site assessments for your level 3 NVQ electrical qualification, we now offer live remote site observations using your mobile phone as a live link to our video-conferencing system – VIDYO. Your assessor can carry out a direct observation of you without the need to physically visit your site. You simply click on a link that we send you in an email and the assessor can then connect with you via your mobile phone and a Bluetooth headset. We discuss the observation with you beforehand and as soon as you are ready and comfortable the assessment begins. This will enable you to engage with the remote assessments in a safe manner and add more flexibility to the time and date that your assessor carries out the on- site assessment. The Vidyo observation in my opinion was worth every penny – it was very easy to use and to be honest was quite nice having someone else there to chat to as well. Using the headset meant that I could carry on with my work and get the job done without keep stopping to talk on the phone etc. I have not had a physical site observation so cannot compare, but would imagine this is easier, all I needed was some additional battery power and a tripod etc. I think from my point of view it was a better option to just pay for you to watch me and oversee my work as have honestly not got the time or patience to sit and write up site diaries and take photos. I am not out to cut corners by just going down the easy route, but if it amounts to the same thing, then unfortunately buying the easier option (in my eyes) was the better option. I think this is the best thing ever, to be honest, if you were not offering this as an option, then I doubt very much I would ever complete the NVQ. Yes OK, its cost me a bit more but its hardly much in the scheme of things, its a few good jobs, but then its done, I can forget about it, and I can get my JIB card and get on sites if I need to.